Learn about the temperament and personality of the Cocker Spaniel. Discover what he's like to live with, his traits and characteristics and how he generally behaves. And look at lots of Cocker Spaniel photos. Originally (and sometimes still) bred as a gun dog (a hunting dog), the Cocker Spaniel has become one of America's most popular breeds. They love people and crave attention and affection from their masters. They want to be with their families as much as possible and will apply for the position of your shadow, if you're hiring. They do not do well if left alone for long periods of time. A Cocker Spaniel who does not get enough attention will become destructive. They are busy, active and playful, but can be headstrong. Consistent discipline is needed. However, Cocker Spaniels do well in agility, obedience, and therapy. They have a moderate need for exercise, and will need a daily outlet for their energy. They usually enjoy playing ball or Frisbee and learning new tricks. They are athletic, agile, and speedy, and love to just hang out outside, romping around with their families. They are good with other animals and love to live with other dogs. They are excellent with children. They will eat anything and everything in sight, and may try to steal your (and your children's) food. Don't be surprised to find your Cocker Spaniel on the kitchen table licking out the butter dish. They are like a living doorbell (quick to raise the alarm if a stranger approaches the home), but are very friendly with visitors. Your friends will learn to be welcomed by a rapidly wagging tail. These are loyal, loving, sensitive little dogs who make great companions! The Cocker Spaniel is very intelligent and easy to train. He learns new commands very fast. The Cocker Spaniel sheds a fair amount of hair. You'll find hair stuck to your couch, carpets, clothes and everything else in your home. 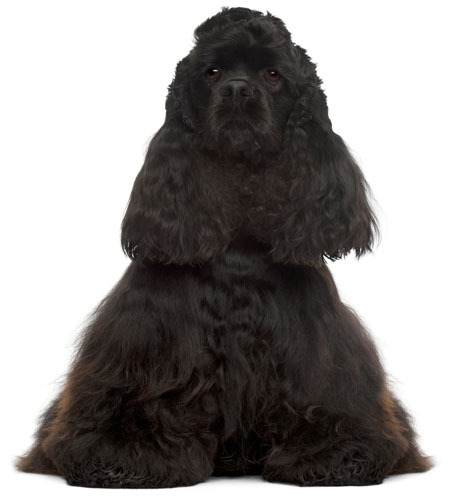 The medium-length coat of the Cocker Spaniel requires brushing a few times a week to keep it tangle-free.